In just a few days, we have coming up what is, arguably, the biggest festival celebrated in India - Diwali or Deepavali, the festival of lights. Lakshmi, the goddess of wealth and prosperity, is worshipped in this festival. The belief is that She blesses a home that is clean and well-decorated. More practically, it affords a once-a-year chance to clean up, paint and decorate your home. 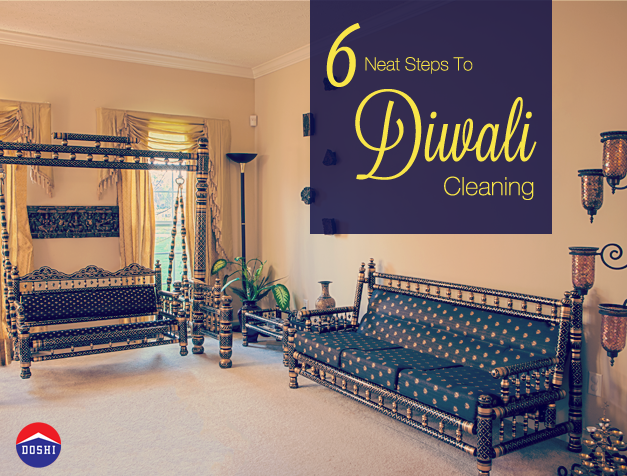 Now, cleanliness being next only to Godliness, we figured we’d share a few tips and DIY suggestions to make your Diwali cleaning a breeze. Make a to-do list and place it in a spot that is easily visible to everyone at home. Starting one room at a time, check shelves, cabinets and wardrobes and edit, edit, edit! Remove the stuff you do not need and give them away to people who do. You will de-clutter your home and also be doing someone a good turn. If you do choose to paint, get started well in advance and pick a quality brand; there are several in the market offering an exciting palette of colours. If your home has plastic emulsion on the walls and enamel paint on doors, windows and grills, just wash off stains with warm soapy water and a sponge. Many of the smudges on walls can also be removed by gently rubbing on them with sand paper. Smaller marks can be removed with an eraser. Believe it or not, toothpaste works very well in cleaning stains and marks on the wall or furniture - apply white, non-gel toothpaste on the spot that requires cleaning, wait till it dries and clean with a soft brush and warm water. For sparkling glassware and fine crystal, wash them in a basin of warm soapy water and use a mix of equal parts of clear vinegar and water for a final rinse. Clean light fittings and fans with a damp cloth dipped in warm water mixed with a little vinegar and wipe dry with a soft cloth. Invest in some microfil cleaning towels/gloves to avoid lint clinging to the surfaces you are wiping or dusting. They are also perfect to wipe the monitor and television screens. Cotton wool dipped in vinegar (or a few drops of gin or vodka, if you have the booze handy) is great for cleaning switchboards and other laminated surfaces. Arm yourself with your vacuum cleaner and go over all your upholstery, cushions and beds and even curtains that cannot be washed. Baking soda is great for cleaning greasy kitchen surfaces, stoves and ovens. Just make a paste of fresh baking soda with a little water and apply it on the counter and appliances. Leave for a few hours, wipe off and watch them shine. Clean your brassware and lamps with a lump of tamarind mixed with salt. (Tomato ketchup will work well too.) Then wash well with your regular cleaning powder or solution. For sparkling silverware, rub Vibhuti - available in departmental stores in South India - on your silverware before wiping them dry with a soft, clean cloth. Again, non-gel toothpaste is great for removing tarnish from silver. Be careful, though. If you are cleaning serving dishes, plates and bowls made of silver, do give them a regular washing with dish-washing powder/liquid and water. The cleanliness of a house is directly proportionate to the state of its bathrooms. Clean thoroughly to remove mould, hard-water scaling, dirt and stains. Wipe the tiles and floor to keep them dry. Put out fresh towels and new soap, and spray some air-freshener. There are plenty of cleaning materials and gadgets available today that can make our busy lives easier for us. What we are suggesting are non-toxic, quick and easy solutions for the house-proud man or woman. Doshi Housing wishes you and your loved ones a happy, clean and safe Diwali.